The alarming increase in Skin Cancer's show one the need for Sun Protection Lotions and Creams. The incidence of Skin Cancer equals all the other forms of cancer combined. It has been conclusively shown that exposure to UV Rays can lead to skin cancer. 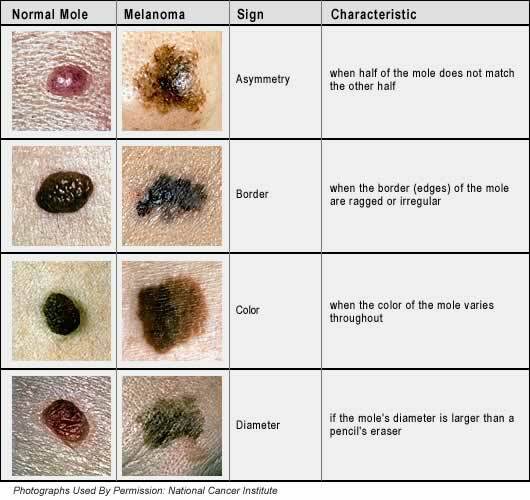 Skin cancers develop typically from moles on our skin. What is the appearance of a normal mole ? A normal mole is typically brown, dark brown or even skin coloured. They are typically round or oval in shape. The mole normally has a diameter of less than 5mm. They should be flat or can be slightly domed in shape. What do Cancerous Moles look like? Moles normally develop by the time we are 25, any moles appearing after that should immediately raise suspicion. The following simple ABCDE rules have been developed to help you identify any possible skin cancers. B is for Border: A mole should have a clear defined edge, it should not fade into your skin, or have any irregular marks at there edges. C is for Colour: A mole should have the same colour throughout. It should not show any discoloration over time. It should not have any purple, blue , white or pink colours. D is for Diameter: A mole should have a diameter of 5mm or less. If you have a mole that is growing. E is for Elevation: A mole should be flat or possibly slightly domed in shape. If you have a mole that is growing taller consult your family doctor. If you have any Symptoms described above consult your family doctor, remember 98% of Skin Cancers are easily treatable, allow the cancer to spread from your skin into your body, and the odds of survival are greatly reduced. Children Sun exposure in the first 20 years of life is a strong determinant for the risk of skin cancer. Therefore sun protection throughout childhood and teenage years is probably crucial to preventing such carcinogenesis. Direct sun exposure should probably be minimized in children, and if they must spend periods of time outside during the day, physical blockers such as clothing should be used; failing that, sunscreen's. Sprays and gels should be used with caution in young children as they can irritate the skin and exacerbate atopic dermatitis. Sunscreen's are not recommended for use in children less than 6-12 months of age in order to discourage unnecessary sun exposure. However, there is no strong reason to suggest that sunblock are harmful in this age group. Further comparisons between healthy and unhealthy moles. As most Skin cancers are caused by exposure to UV A and possibly UV B ( Or a combination of UV A AND UV B rays ) the simple answer is to avoid them, this this is unfortunately not practical or possible for the majority of people. Wear a hat that casts shade all over your face, baseball style caps provide only limited protection, it is a far better idea to use a hat with a broad brim. Don't forget to apply Suncream on overcast days, over 80% of the suns UV A and over 50% of the suns UV B rays can pass through clouds. The sun is the major cause of skin cancer, identifying cancerous moles and skin cancers and how skin cancer can be treated. How to prevent skin cancer? 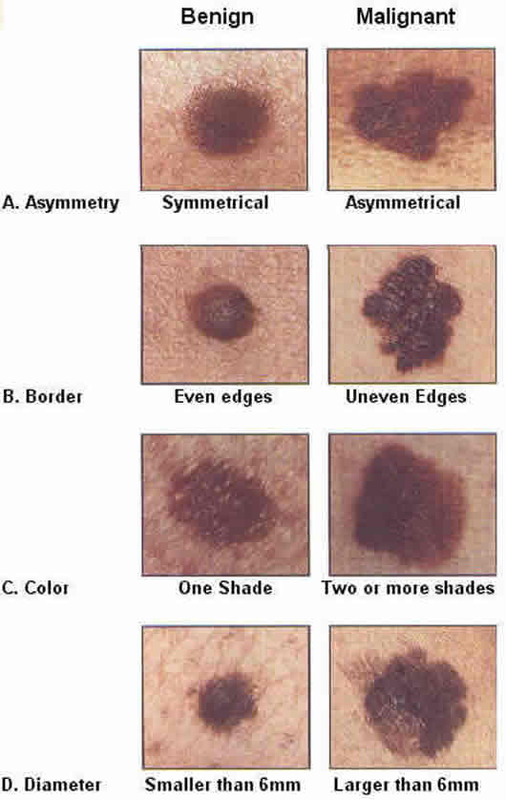 This page will show you what does skin cancers look like? The use of Sunblock that blocks UV A and UV B has been proven to diminish the risk of skin cancer according to numerous surveys worldwide.